Report Lays Out 10 Most Censored Countries : The Two-Way The Committee to Protect Journalists says Eritrea, North Korea, and Saudi Arabia are tops at silencing journalists. 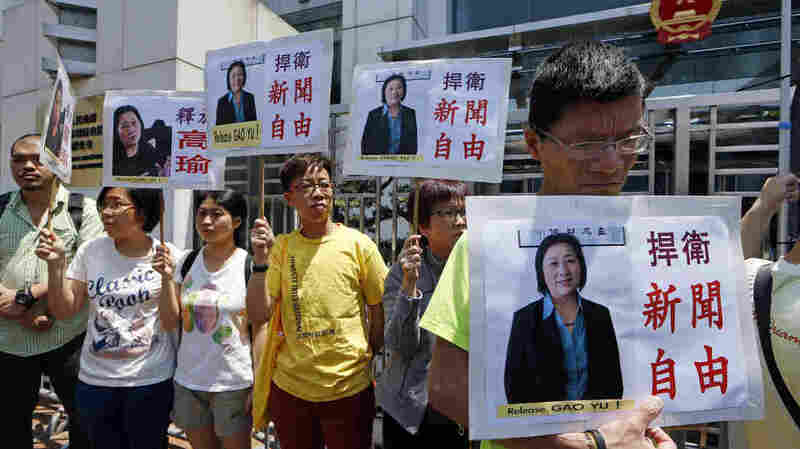 Protesters support jailed veteran Chinese journalist Gao Yu during a rally outside the central government's liaison office in Hong Kong last week. China ranks eighth on the Committee to Protect Journalists' list of 10 most censored countries. The Committee to Protect Journalists released its annual report on the 10 Most Censored Countries today, with Eritrea, North Korea, and Saudi Arabia leading the list. Iran ranks seventh on the CPJ list. The CPJ is an independent nonprofit organization based in New York that "promotes press freedom worldwide and defends the right of journalists to report the news without fear of reprisal." According to the CPJ, top-ranked Eritrea, a country in northeast Africa, has created "a media climate so oppressive that even reporters for state-run news outlets live in constant fear of arrest." "The last privately owned media outlets in Eritrea were suspended (and their journalists jailed) almost 15 years ago." "North Koreans looking for independent information have turned to bootlegged foreign TV and radio signals and smuggled foreign DVDs, particularly along the porous border with China." "In 2014, the Saudi Arabian government "issued a new anti-terrorism law and regulations that Human Rights Watch said will 'criminalize virtually any expression or association critical of the government and its understanding of Islam.'" Ethiopia imprisoned 10 journalists and bloggers in 2014. Vietnam added a new law in 2013 that extended state censorship to social platforms, making it illegal to post foreign news articles that "oppose the state." Myanmar's Printers and Publishers Registration Law, which went into effect in March 2014, "bans news that could be considered insulting to religion, disturbing to the rule of law, or harmful to ethnic unity."